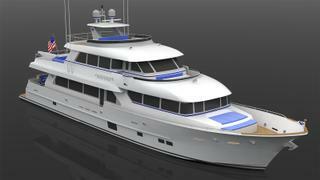 Boutique yard Paragon Motor Yachts has released details of a 32.91 metre model called the Paragon 108. 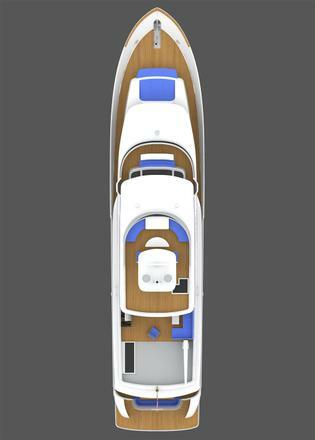 Developed in response to a client request, this new design features a 7.32 metre beam, which creates more living space on board. The Paragon 108 is the first model from the yard to offer a Portuguese bridge layout, while other key features include a large aft deck with plenty of room for tender storage, and a cavernous skylounge, which boasts a large entertainment area and wet bar. Al fresco dining is offered on the aft deck, allowing all eight guests to enjoy a meal together sat around a custom teak table, while the main-deck saloon features plentiful seating options and an adjacent day head. Accommodation is for eight guests in four cabins, including a split-level master suite — the bedroom is situated on the main deck and an en-suite bathroom with Jacuzzi tub can be found below. An amidships VIP, portside twin cabin and starboard double cabin complete the guest layout. Meanwhile, the aft crew quarters can accommodate a staff of up to four people. 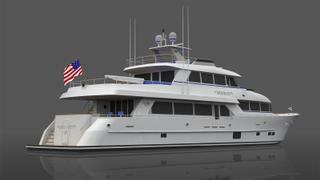 The yard is offering the Paragon 108 with a variety of deck configurations, including flybridge, open bridge and cockpit versions. No details of the engine installation or estimated performance figures have been released, but Robinson adds that the hull has been designed with a fine entry to ensure the smooth and quiet ride that his yard's yachts are famous for. 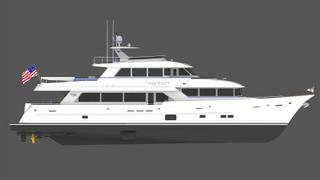 Fully engineered, the Paragon 108 would be built at the yard’s Taiwan facility and delivered as a turnkey motor yacht within 20 months of contract signing. Should it come to fruition, the 108 would be the largest Paragon project to date, surpassing the 30.48 metre Kaytoo, which was launched back in 2014.